Members of the SAAB Owners Cub receive a copy of the club magazine 'SAAB Driver' bi-monthly. The magazine (A4 size) is a 64 page colour publication. The magazine carries articles, news, technical, events and many other items. The content of the magazine varies from month to month. Features include Steering Wheel, Car Clinic, Post Bag, Model Registers etc. 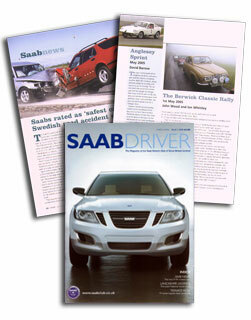 Other articles which appear in the magazine include members reports and stories of their SAAB experiences. Motorsport reports from members competing at various levels of competition. The 'SAAB Driver' is the main means of communication between members and provides the opportunity to air views and ask questions. A sample copy of the magazine is available to download in Adobe PDF format.